Building and measuring the engagement of your customers and supporters is key to getting better marketing results. As part of our efforts to make your SEO work more efficient, we’re happy to introduce the new Social dashboard in AWR Cloud, which provides great insights about your website and live stats for your social media engagement activity. Now you can easily keep an eye on the exposure of your website and your competitors on the top 5 Social media platforms. 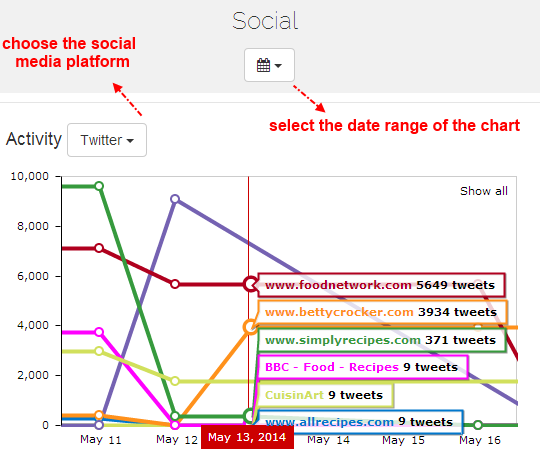 The Activity section of the new Social dashboard shows you a chart with the evolution in time of the social shares received by all the domains you are tracking in a project. This way, it is very easy to keep an eye on the progress of your social media exposure, and compare it to your competition on a daily basis. 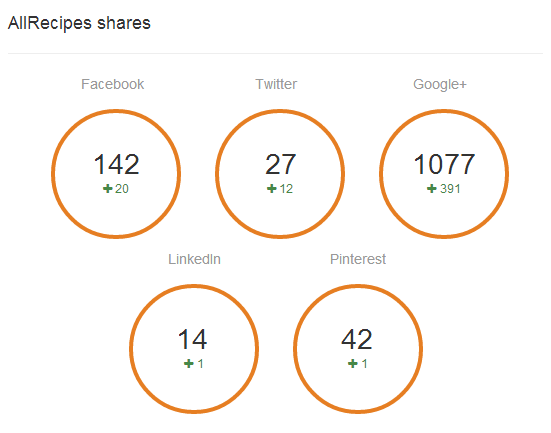 Below the chart, you will find the Shares section which shows you the number of social shares that your website’s index page (or the specific URL that you are tracking) currently has on Facebook, Twitter, Google+, Linkedin and Pinterest. These stats are updated on a daily basis, comparing the current number of shares to the values recorded on the previous period selected in the screen. You can now track your performance on Twitter and Facebook by connecting your accounts with AWR Cloud. 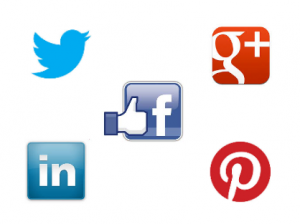 This is easily achieved from the Social dashboard, or from the Settings – Website settings – Social menu. 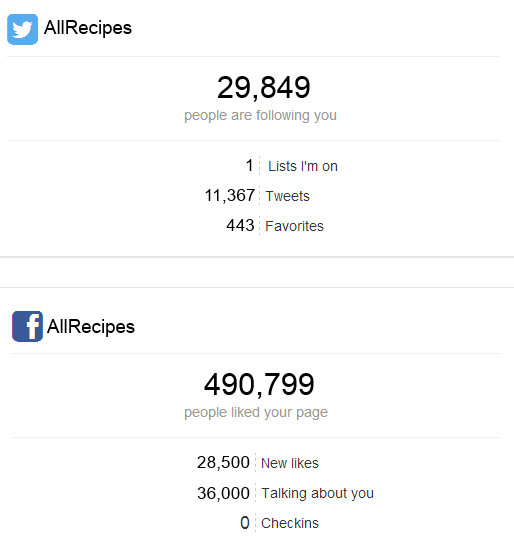 Once you connect your Twitter and Facebook accounts, you’ll be able to see the social stats updated live, each time you access the Social dashboard. You can connect AWR Cloud to as many Twitter accounts as you need, and select the relevant one in each project you are monitoring. When it comes to Facebook stats, you can connect only one profile to your AWR Cloud account and then select the page you want to track in each project. If you need to switch to another Facebook page, or to disconnect an account from AWR Cloud, you can easily to this from the Settings – Website settings – Social menu by clicking on the Disconnect button. You can now compare the evolution in time of your visits to a previous period. 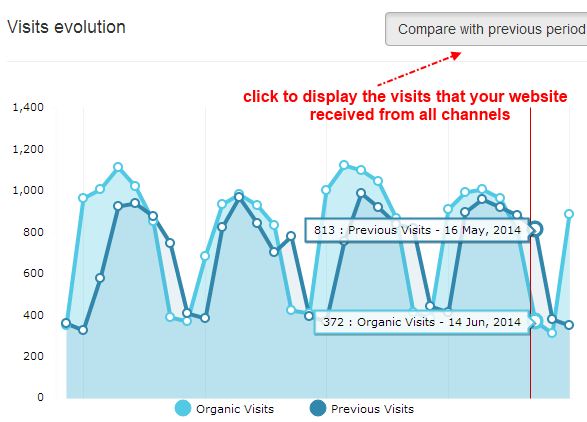 This is achieved in the Dashboard – Analytics screen by clicking on the Compare with previous period button. 1. Reports – Report history. Here you have three new reporting filters which allow you to select all reports generated and shared online, new reports which have not been read yet and reports which need your approval to be further made available to your recipients. 2. Rankings – Website Ranking and Keyword Ranking. These views now include two new filters: Second Page, for displaying only the keyword positions for which your website was found on the second page of the search engine results list, and one for displaying the results that belong to a specific type (Image, Video, Organic etc.) when the selected search engine is Google Universal. We introduced a new option which allows client users to generate quick reports. To grant your clients permission to generate reports, navigate to the Settings – Website settings – Website menu and select Everyone in the related drop-down list. This will tell the application that all users who have projects assigned to them can generate quick reports. You can find more details about user management in AWR Cloud in this help section inside the application. 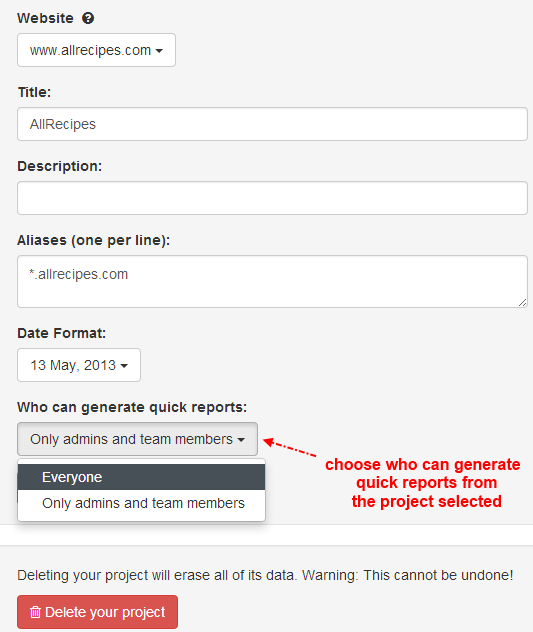 Note: quick reports generated by client users will be counted to your shared reports monthly quota. Starting from the new release, you can sign in AWR Cloud with your Facebook, Google + or Twitter accounts. To to this, click on the social button of the platform that you would like to use and further authorize AWR to access your account. Now you can export your keyword ranking data to CSV format only for specific projects that you select in the New export dialogue. This is achieved from the Settings – Website Settings – Export / Import menu. Starting from the new release, we introduced a new Google Places search engine which tracks and counts only the Places listings that Google blends with other types of results in Web search. AWR Cloud also comes with a new section available for selection in the CSV printable reports. 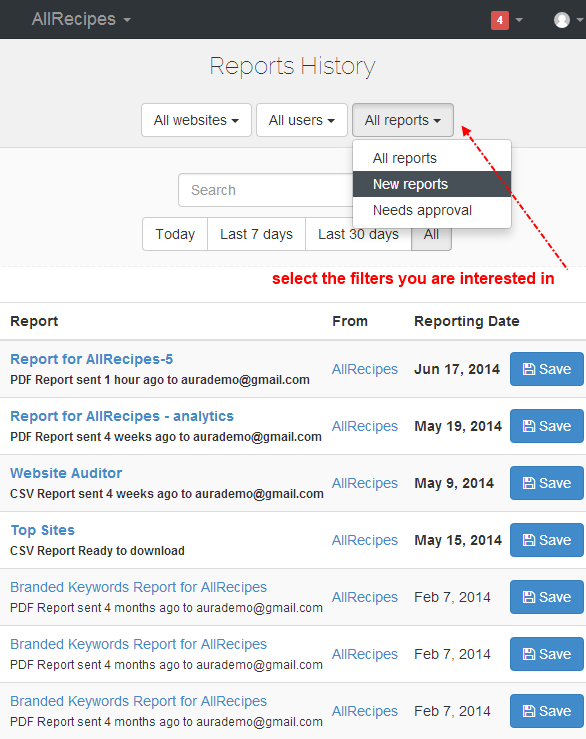 To see it in action, simply create a new CSV report from the Reports – Edit reports menu and add the Top Sites section. So, what do you think? Feel free to let us know your thoughts in the comments section below. If you haven’t tried AWR Cloud yet, you can easily Sign up and take advantage of the 30 day Free Trial. 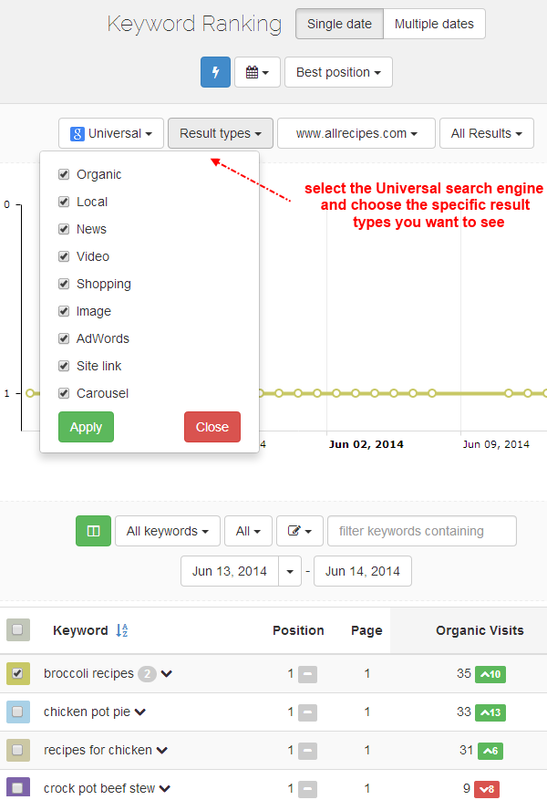 2/ Some months ago AWR Cloud Google Universal Search Engine was counting every element on the page as the position. For example: my site was at the 2nd place just below 4 images that are horizontally aligned. AWR Cloud was showing me the position 5 for my site whereas it was at the 2nd place. It is very embarrassing for my clients. Is it still the case ? 1/ Many of our customers who track Universal results requested the Second Page filter, because position 11 is not always on the second page. There are many cases where the first page of the results list contains an Images block or Places entries, and thus it comes with more than 10 results. While sorting by position can help estimate for which keywords your website is on the second page, the new filter offers certainty in this matter. 2/ Google Universal always tracks and counts all website URLs that represent a position, even if they are in an Images block. Each of the images has a different URL that the searcher can click on and land on a competitor site. If you would like to track and count only the traditional organic results, you could use the Google Organic search engine. Please write us at help@awrcloud.com or via the support channel inside the application and we’ll be happy to help in this matter. Awesome guys! Thanks for listening your customers! Great, thank you for this very interesting post !